Bouke de Vries, War and Pieces, 2012 (installation view). 18th-, 19th-, and 20thcentury porcelain, plastic, sprayed plaster, acrylic, steel, aluminum, gilded brass, and mixed media. Photo courtesy of Wadsworth Atheneum Museum of Art. In Europe toward the end of the Renaissance, banquet tables of the wealthy were sometimes filled with more than food. Long centerpieces depicted soldiers made from costly sugar and porcelain who battled it out among the dishes. 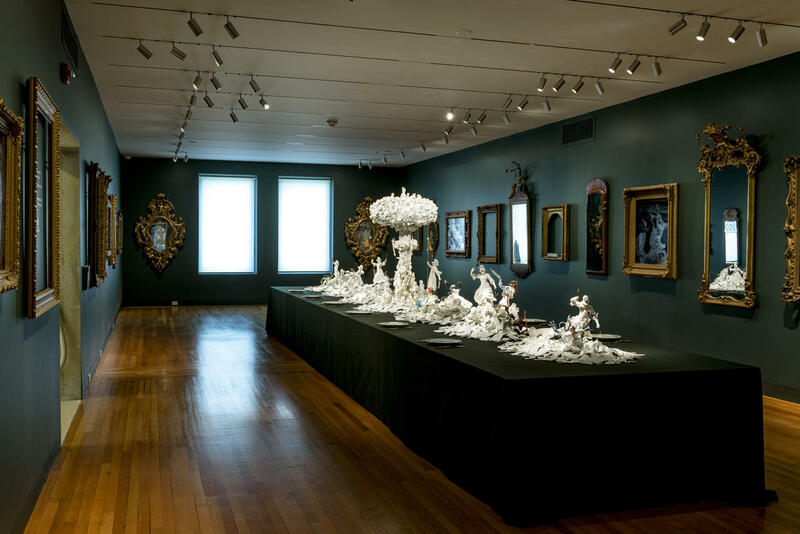 Inspired by these centerpieces, Dutch artist Bouke de Vries made a 21st-century version, and it’s at the Wadsworth Atheneum Museum of Art. The sculpture is displayed on a long table with 12 place settings, but no chairs. As in historic Europe, the sculpture is made from sugar and porcelain. And it has one other ingredient, which seems to be the enemy. “I decided, rather than have a real-life battle — given the choice — we’ll have a battle on the table, between porcelain and sugar and plastic,” de Vries said.